The Yellow Mountain or Huangshan (黄山), is a mountain range in southern Anhui province in eastern China. 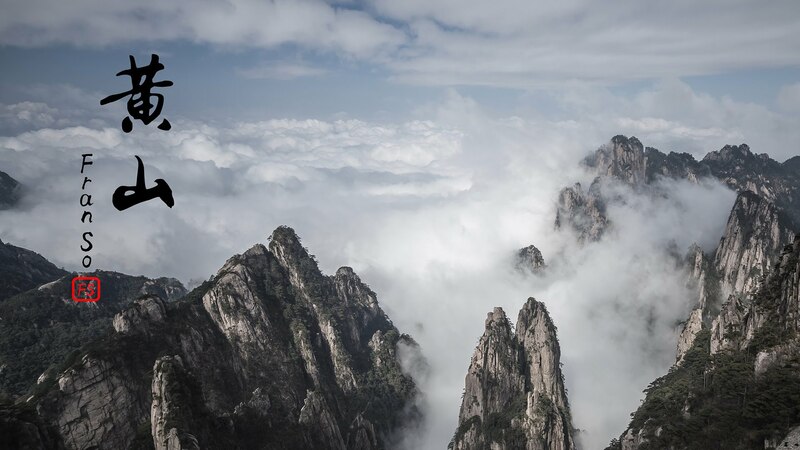 It is well known for its scenery, sunsets, peculiarly-shaped granite peaks, Huangshan pine trees, hot springs, winter snow, and views of the clouds from above. Huangshan is a frequent subject of traditional Chinese paintings and literature, as well as modern photography. During the Qin Dynasty, Huangshan was known as Yishan (Mount Yi). 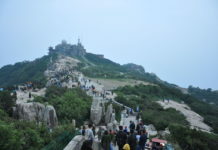 In 747 AD, its name was changed to Huangshan (Mount Huang) by imperial decree; the name is commonly thought to have been coined in honor of Huang Di (the Yellow Emperor), a legendary Chinese emperor, and the mythological ancestor of the Han Chinese. One legend states that Huangshan was the location from which the Yellow Emperor ascended to Heaven. Another legend states that the Yellow Emperor “cultivated moral character and refined Pills of Immortality in the mountains, and in so doing gave the mountains his name. The first use of this name “Huangshan” often is attributed to Chinese poet Li Bai. Huangshan was fairly inaccessible and little-known in ancient times, but its change of name in 747 AD seems to have brought the area more attention; from then on, the area was visited frequently and many temples were built there. It was named a UNESCO World Heritage Site in 1990 for its scenery and for its role as a habitat for rare and threatened species.